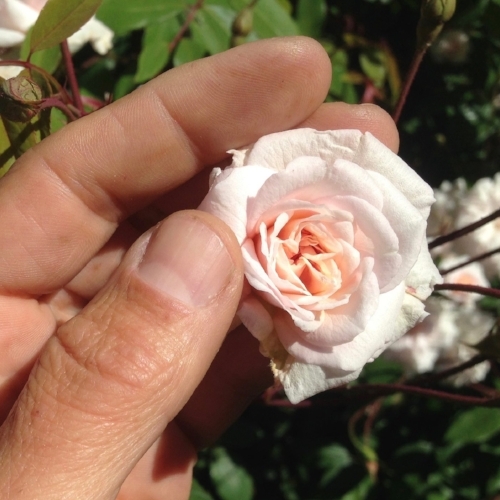 Wander around, stop and smell the roses, discover some special, fragrant blooms to harvest. Put a little love in your heart. Admire the roses, bring a sense of love and appreciation to your heart, request permission from the plant to harvest and set your intention for the medicine you wish to make. Harvest the most fragrant, freshest blooms. Be sure to harvest no more than 5% of the flowers to leave plenty for humans and other creatures to enjoy. Make sure to take note of when and where you gathered your flowers. Fill a glass vessel with fresh petals. Cover with a neutral-flavored spirit with 40% alcohol content (I like plain 80 proof vodka). This is the time to improvise and add other herbs or spices to the mix. Roses are delicate, so go easy. I usually add 3 sliced vanilla beans. Add some extra love medicine by singing, humming or playing love songs while you work! Set aside for at least 1 month in a cool place out of direct sunlight. Shake it from time to time, set it on your altar, observe the colors in the jar as they change. Strain the soaked petals through some cheesecloth and reserve the alcohol extract. Dilute the rose extract with a little honey water to lower the alcohol content and enhance the flavor. Heat some filtered water until it's just warm enough for the honey to dissolve. Let the honey water cool then add to your rose extract. I use honey from my parents' beehive for extra love. Step 6: Mellow Out & Enjoy! Give the elixir a little more time. Any cloudy, solids will settle to the bottom of your jar. When the elixir is crystal clear, pour it into a serving vessel of your choice. Share it with someone you love!